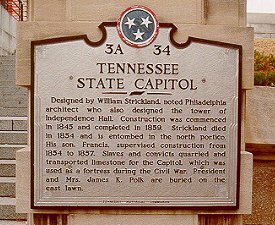 Tennessee was my first theretofore unvisited state on the Dallas road trip. I left my hotel in Bristol, Virginia, that morning, had breakfast, and hit the gas station for the first of what would be a personal record three complete fill-ups in one day. When I left home in New Jersey we had no snow, but I had been hearing reports of great snow and ice storms in the southern Appalachians. Bristol is about three miles from the state line, so pretty much as soon as I got in my truck it was already time to stop. This is the state line crossing on I-81 in the similarly-named town of Bristol, Tennessee. Al Gore was still Vice President at the time. I don't know if you can make it out, but the Tennessee welcome center was closed. I-81 was a decent ride; I had to keep it floored pretty much to stay ahead of the truck that was on my tail. It was interesting in that the skies were all clear, but there came a point where I crested a hill and almost instantly descended into a large mass of fog. Soon I reached the southern terminus of I-81. I've been on every mile of I-81 excepting two gaps: one from the northern terminus in the Thousand Islands on the New York/Ontario border to Syracuse, the other in Pennsylvania between I-380 and I-78. The ride was rather wide open until I approached Knoxville, which apparently is quite proud of their UT Volunteers. Between Knoxville and Nashville I personally drove across a time zone for the first, um, time, right around milepost 338. I-40 goes up along the southern edge of a long ridge and, the trees sticking up over the downslope notwithstanding, provides a panoramic view of east-central Tennessee. Since one of the whole impetuses (impeti?) of the Project was the graphical features of the various state welcome signs, I was anticipating what the signage would be like for a time zone on this, one of the four longest Interstate highways in America. And along that ridge, I saw just, "Entering Central Time." Oh well. Getting closer to Nashville, I popped a tape out of the tape deck and decided to try the radio for a while. And here, smack dab in the middle of the Bible Belt, I heard programming virtually alien to my native neck of the collective woods: evangelists. Not "a", mind you. But a whole gaggle of'em. "...and God said, 'Abraham, I'll bless the folks that bless you'..." (hit the seek button to change the station) "...John 15:20: 'Remember the word that I said unto you: The servant's not greater than his Lord.' If they have persecuted me..." (seek button) "...gracious and winsome and open to change, and to invite the edge to come closer. Guard us, our father, from becoming brittle..." (seek button) "...your soul is mind, emotion, and will..." (seek button) "...he wants to exalt you! God doesn't want you to stay in certain levels. God wants to take you to a higher plane, a higher level! It comes through obedience to what? The word of God..." (seek button) "...and so they went with it, and they learned through forty years of experience what it would cost to disobey God..." and so on. I had my camcorder mounted on the passenger seat, so these are all exact quotes. West of Nashville the scenery seemed to level off and make the transition to a more midwestern-plains type appearance. As I wanted to get a picture of the welcome sign in Missouri, I left I-40 in Jackson and headed northwest towards what I call Missouri's Tab along US-412, unfortunately thus bypassing Memphis. 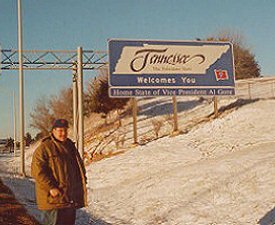 By the time I came back down to I-40 on the other side of the Mississippi, the December night had already fallen, I was already on the outskirts of the Arkansas city of West Memphis, and Tennessee was behind me. Downtown Nashville is situated on the southern banks of the Cumberland River as it meanders and oxbows its way westward from Dale Hollow Lake to Lake Barkley. 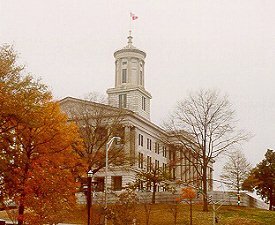 A few blocks up sits the Tennessee State Capitol. Designed by William Strickland, noted Philadelphia architect who also designed the tower of Independence Hall. Construction was commenced in 1845 and completed in 1859. Strickland died in 1854 and is entomed in the north portico. His son, Francis, supervised construction from 1854 to 1857. 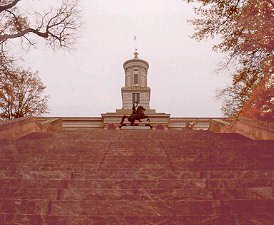 Slaves and convicts quarried and transported limestone for the Capitol, which was used as a fortress during the Civil War. President and Mrs. Polk are buried on the east lawn. Indeed they are. 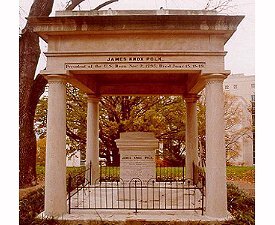 Our eleventh President, whose two notable achievements are the annexation of Texas and, unfortunately for him, being a possible rejoinder for an oft-repeated axiom (that one about how hard work never killed anybody � he died after only three months out of office), James Knox Polk rests beneath a limestone pavilion (I'm not too familiar with funeral architecture) just off the east front. 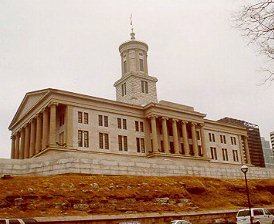 The lawns of the capitol grounds are notable from those of other states. 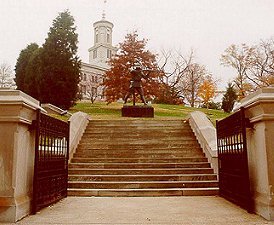 For one, the Tennessee Statehouse sits atop a very steep hill. In the picture above, I'm standing across the street from the east lawn. Judging by the overhead photo (accessible via the Terraserver link), it would seem that a walkway leads east towards 5th Avenue North. But alas, it's actually a rather long set of steps. This hill makes it rather difficult to enjoy the lawns around the grounds. 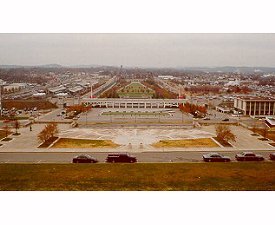 But a short walk over to the north portico lends a very panoramic view of Bicentennial State Park, located between 6th and 7th Avenues North, serving as a sort of Capitol Mall. 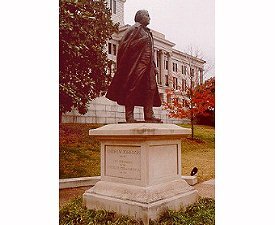 Also honored on the capitol grounds is another President, Andrew Johnson, a Tennesseean memorialized with a bronze statue. His likeness almost looks like he walked out of his impeachment trial, acquitted by one vote, yet defeated nonetheless. 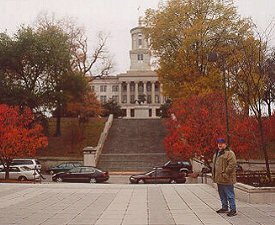 By now it was time for me to take my leave of Nashville. During the months of and right before winter the temperature drops: Even the sun gets cold, and thus it wants to make its appearance and then go home as soon as it can. Despite the new time zone's providing an extra hour it was time to hit the road again. I must get to Missouri before the sun catches the old 5:15. No time to dawdle. The old highway's a-callin; time to move on. The Grand Ole Opry would have to wait for another trip. I don't like country music anyway. This page loaded in 2.722 milliseconds.